Bring a blanket and enjoy this free early summer performance – a NYC favorite! The concert features the ISO Symphonic Band, founded in 1995 to sponsor talented students throughout New York City and led by the band’s inimitable founder and conductor Brian P. Worsdale. Each year we feature the works of Green-Wood’s permanent residents Fred Ebb, Louis Moreau Gottschalk, Leonard Bernstein, and many others. Enjoy the beautiful landscape with your fellow New Yorkers, as well local vendors selling food and drink throughout the day. The concert is a free event, but please register below so that we can gauge response. We encourage you to consider making an optional donation with your reservation, to ensure our ability to continue to offer these events free of charge. Mobile users: Please tap here for concert registration. 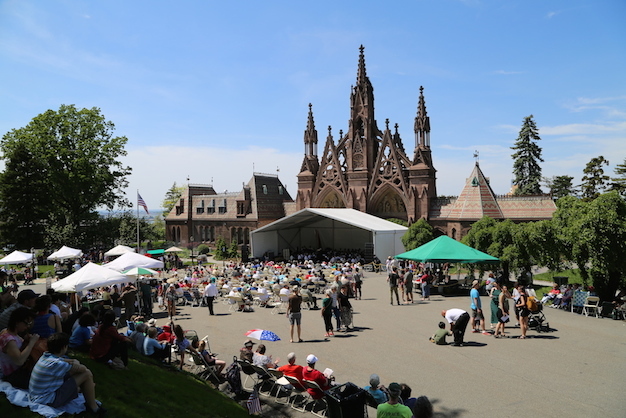 A special trolley tour with Green-Wood Historian Jeff Richman begins immediately after the Memorial Day concert, featuring Green-Wood highlights and veteran connections. $15 for members of Green-Wood and BHS/$20 for nonmembers. Green-Wood trolley tours are fully accessible and ADA compliant. This event is sold out. Make sure you never miss out on tickets again! Green-Wood members get access to tickets weeks before the general public. Join today. Green-Wood thanks the Brooklyn Daily Eagle for its generous sponsorship. STATEWIDE OIL & HEATING CO., INC.
Green-Wood is proud to partner with local business for this event.